Nineteen young men died playing football in 1905. Another 137 were seriously injured. Football has always been a violent sport, but calls to make the game less brutal were widely mocked at the turn of the 20th century. Satirical magazines of the time warned that the football players of the future would become effeminate dudes, bowing to each other on the field. The new rules would include, "No pinching, no slapping, and hug easy..." Sound familiar? The illustration below appeared in a 1906 issue of Judge magazine. Of those slaughtered eleven were high school players and ten of the killed were immature boys of 17 and under. Three hardened, seasoned and presumably physically fit college men were slain. The others were amateurs. Body blows, producing internal injuries, were responsible for four deaths, concussion of the brain claimed six victims, injuries to the spine resulted fatally in three cases, blood poisoning carried off two gridiron warriors, and other injuries caused four deaths. Among the injuries that have not resulted fatally are: broken collar bones and shoulders, nineteen; broken legs, thirty-one; broken arms, nine; fractures to some portion of the head, nineteen; broken ribs, three; spinal injuries, three; concussion of the brain, three. The Intercollegiate Athletic Association of the United States (IAAUS) was formed in early 1906 with the stated mission of reforming the rules of college sports. Its first mission was making football safer. The IUAA would take the name National Collegiate Athletic Association (better known as the NCAA) in 1910. President Roosevelt himself encouraged the revision of football's rules after his son was injured playing for Harvard. And despite warnings that dialing back the brutality of the game would somehow make America's men soft, people were getting sick and tired of people dying for a game. But the alternative to making it less brutal could very well have been doing away with the sport altogether. Instead, football got the forward pass. By fall of 1906 the new rules were in place. The September 23, 1906 edition of the New York Tribune ran an article intended for both players and spectators to better understand what was allowed. 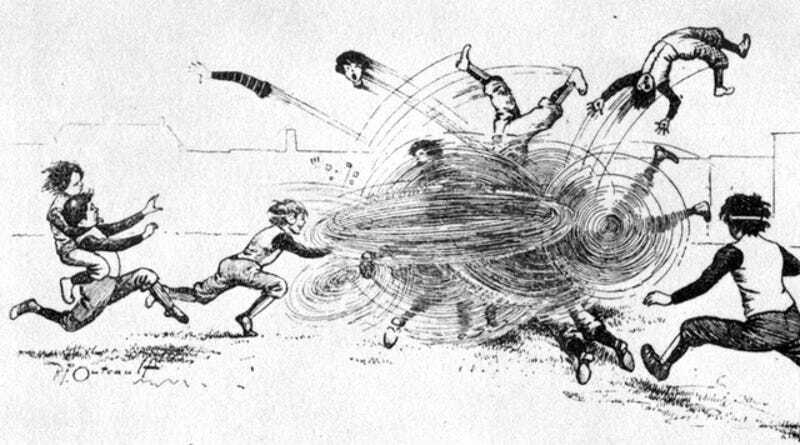 Despite the ways in which football was made safer over a hundred years ago, it's hard to draw lessons for today. When nimble and deceivingly fast 300-pound men bash their heads together play after play, game after game, season after season, it's not exactly a surprise that there's lasting damage which cripples players physically and mentally. But no one is quite sure of what reforms will best ensure player safety. There appears to be no easy answers. Do you make helmets safer as researchers at places like UCLA are attempting to do? Is there such a thing as a helmet that can prevent the kinds of long term injuries players are sustaining? Sadly, most of the research says no. At least not without them being comically huge and puffy, or being so big and cushiony as to cause severe damage to the player's neck on impact. There's a history of fearful fans haranguing about the masculine integrity of football — but the game's survival has always depended on making necessary decisions with the available science of the day.